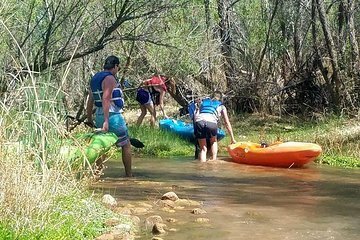 The Verde River is a paddler’s delight offering scenic beauty and adrenaline rushes for beginners and seasoned vets alike. Enjoy all of the rivers various stretches with this ‘Full Montey’ guided kayak tour. Gear up, safety briefing, then hit the water to explore the river and become one with your boat over class I & II rapids. Epic scenery included.